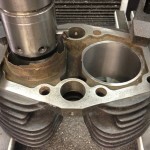 In cases where a motorcycle cylinder barrel has been previously bored to its maximum oversize or damage beyond the size of any available oversize pistons has occurred an effective repair can be achieved by the fitment of cylinder liners. 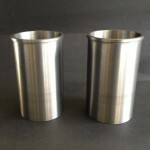 A cylinder liner or “sleeve” is a thin tube of material, usually made from spun grey cast iron, used to repair cylinder bores beyond recovery by re-boring alone. 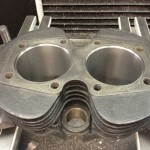 Instances where this might be necessary include occasions where no oversize piston is available, the bore is already beyond the maximum available oversize or the bore is damaged beyond the size of any pistons available. 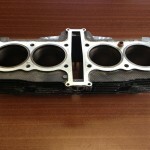 Replacement cylinder liners are often obtained as “blanks” and so are not engine specific. 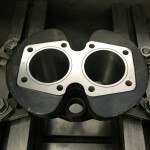 This means that the blank may require additional machining for length or for any cut outs or con rod slots required prior to fitting. For extra security, some liners include a flange as part of their design which means that a second, larger diameter is present at the top of the liner. After machining this flange will fit into a corresponding recess machined into the top of the liner bore. 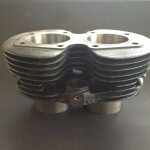 Motorcycle cylinder barrels can be made from either cast iron or aluminium alloy and the repair procedures for fitting cylinder liners vary for each type. 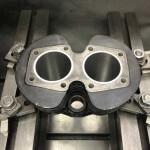 For cylinder barrels made of cast iron the original material will need to be bored out as necessary to allow the fitment of the replacement cylinder liner. 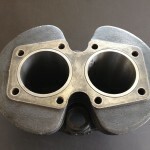 Cylinder liners are held in place by being an interference fit within the original material. To achieve this, the finished diameter will need to be slightly smaller than the diameter of the new liner. To eliminate any possibility if slippage during service, added security can be achieved by using “flanged” type cylinder liners or by machining a security step at the bottom of the bore for a parallel type liner to sit on. 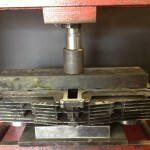 Fitting is aided by using a hydraulic press to push the liner into the original barrel material. If any slots or cut outs are present these must be correctly aligned. 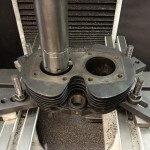 Where necessary any con rod slots or crankshaft “reliefs” will need to be machined in after the replacement liners are installed. Typically the new liner will have a wall thickness of between 1.50mm and 2.00mm. 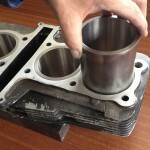 After fitment, the cylinder liners are bored and honed to the finished size to suit the piston. 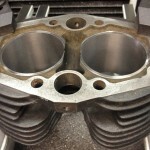 Finally the cylinder barrel is refaced to ensure a perfectly flat surface for the cylinder head gasket. Due to casting imperfections, some original material remained after machining out the original bores. This was too thin to offer any support to the replacement liners and so it was also removed. 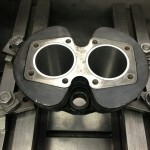 The cylinder barrel is refaced to remove any distortion in the gasket mating surface. Cylinder barrels made from aluminium alloys most frequently have iron cylinder liners which are shrunk into the parent aluminium in order to secure them in place. 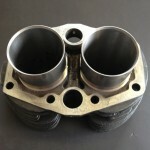 This means that the cylinder liner will be slightly larger in diameter that the housing bore. Liners fitted into alloy barrels will always have a larger diameter top flange to prevent slippage in service. Alloy barrels requiring replacement liners are heated in our dedicated oven which expands the alloy to a greater degree than the iron liner enabling the original liners to be removed more easily. The replacement liners are checked and if necessary the barrel is machined to ensure that they will have the correct interference in service before they are fitted. Fitting is achieved by again heating the barrel in order to expand it. Sometimes it may also be necessary to freeze the liners using liquid nitrogen to reduce their overall diameter. These processes have the effect of creating a large enough differential in sizes to allow the liners to simply be dropped into place. Once the temperatures equalize, the slightly larger liner will be gripped by the smaller diameter housing. As the equalizing process takes place the liner can lift very slightly as the cooling barrel tries to literally squeeze it back out of the housing. To ensure correct seating of the liner the barrel is placed under the hydraulic press and a very light pressure applied until the temperatures have stabilized. 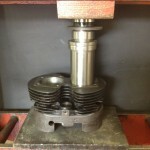 After cooling the barrel is refaced to give a perfectly flat head gasket mating surface. 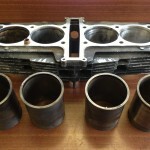 After fitting, the new cylinder liners will require re-boring to ensure that they are the correct size for the piston to be used. Some modern alloy barrels have specially treated surfaces which allow the pistons to run directly on the aluminium with no liner being fitted. Typically these barrels are not designed to be re-bored. 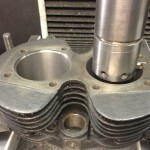 However if damage has occurred it is sometimes possible to machine out the parent material and fit a thin iron sleeve which returns the cylinder bore to its original size.